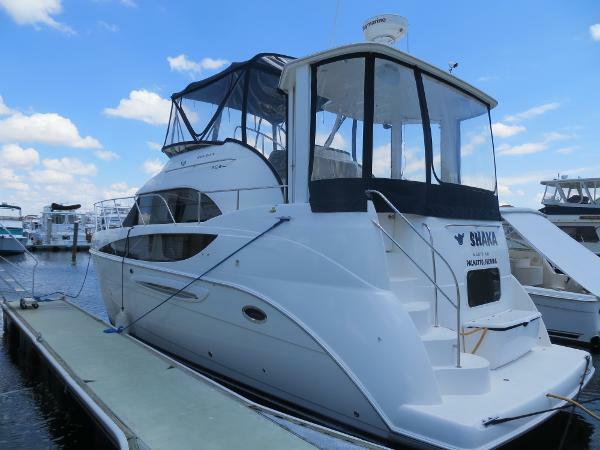 2006 Meridian 368 Motoryacht This 2006 Meridian 368 Motor Yacht is a TON of value. With large 420 HP Mercruiser engines, generator, Chart plotter/Radar, windlass, two stateroom and two heads...this motor yacht is perfectly set-up for cruising and port-hopping. Call today! 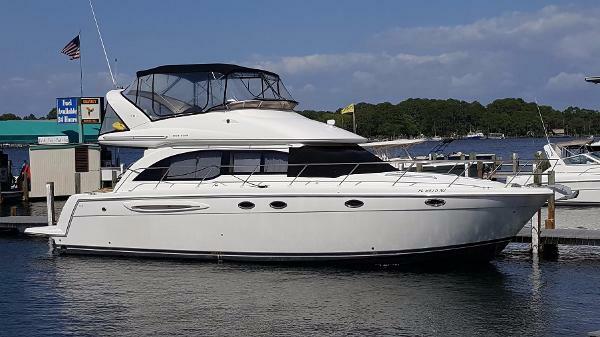 2005 Meridian 368 Motoryacht VERY CLEAN AND LOW PRICED LIVE ABOARD MOTOR-YACHT.THE BOAT HAS BEEN SERVICED AND IS READY TO CRUISE.OFFERS ENCOURAGED! 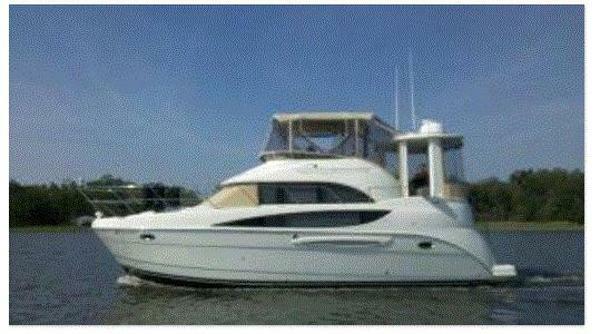 This 2006 Meridian 368 Motor-yacht is a one owner vessel and has been well cared for. The boat shows amazingly well for a 2005. The owner has it on a wash and wax schedule that keeps it looking sharp all year round. The engines have also been serviced well, so the boat is cruise ready. All you need to do is load your gear and go boating. Key Features: Mercruiser gas 8.1 HO engines, with newer exhaust manifolds and services up to date.Kohler gas 10KW generator.Raymarine C-120 color chartplotter.Raymarine DSM250 sounder module.Speco stern and engine room cameras.Bow and stern thrusters.Newer eisenglass.Newer bridge seat vinyl.Super clean and ready for new owners to move aboard and cruise. 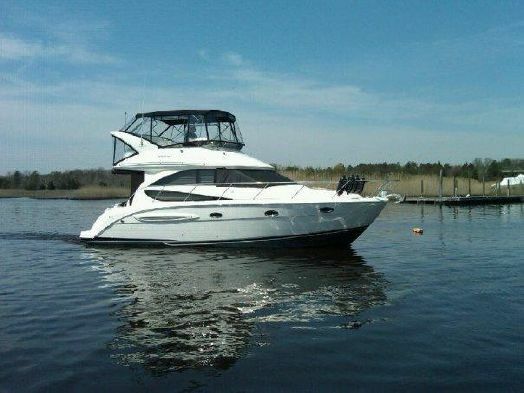 2005 Meridian 368 Motoryacht This 368 Meridian is a MUST SEE!! Don't miss this beautiful, well cared for example of the popular 368 MY by Meridian. 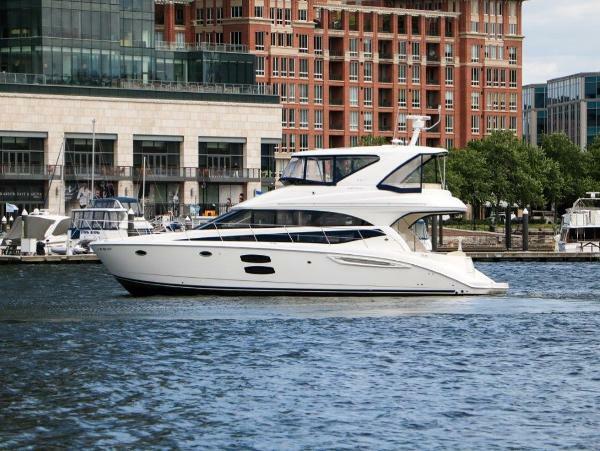 When it comes to amenities the 368 has many of the features found in a much larger motor yacht. 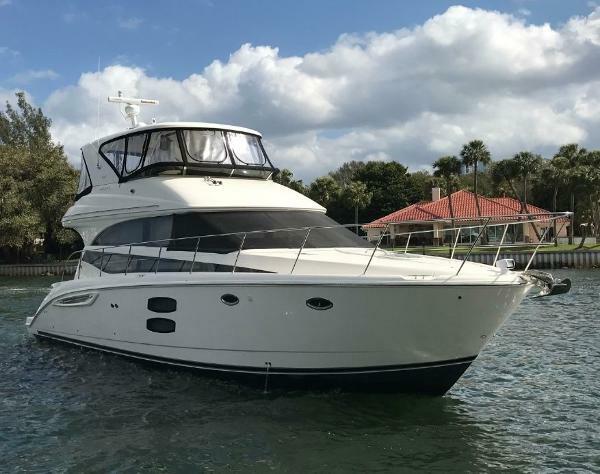 She has a spacious aft deck with a hard top, roomy and fully equipped flybridge, integrated swim platform, and wide - safe walkarounds for a boat her size. Down below there is a large salon with cherry cabinetry throughout, fully equipped galley, two comfortable staterooms, and two full heads with walk in showers. PLEASE SEE FULL SPECS FOR MORE DETAILS! 2012 Meridian 441 Sedan In designing the 441 Sedan, Meridian's team of naval architects developed a new hull, deck, bridge and shearline. This design features a more aggressive profile and hull-side windows for the guest stateroom, easier bridge access, better topside accommodations, and more natural light and woodwork in its interior living spaces. The 441's wide-open floor plan ensures smooth flow and unbroken lines of sight between the salon, the yacht's dedicated dinette and the full-service galley. What's more, Meridian has further enhanced its signature integrated two-tier window system to ensure improved visibility from all these interior areas. A lower helm station is available. Plus the 441's impressive two-stateroom, two-head layout provides a gracious master suite, located forward with a queen-size island berth with innerspring pillowtop mattress. The spacious amidship guest stateroom, which spans the yacht's beam, features a double berth, thoughtfully appointed vanity and settee and plenty of storage. 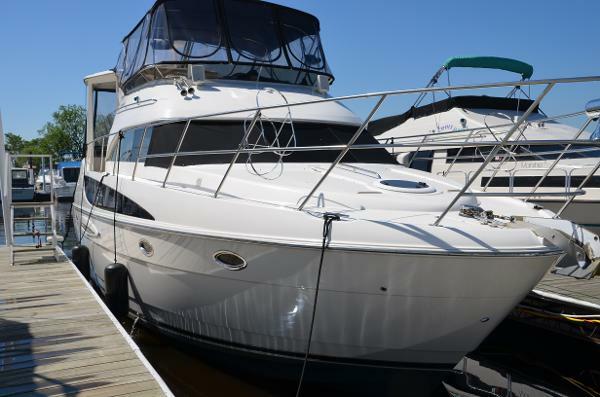 2005 Meridian 381 Sedan This vessel has very low hours, is clean and evidently well-maintained. The owner even had the engines, generator, and electronics thoroughly checked prior to listing for sale. In addition to its two staterooms this boat has a hide-a-bed in the salon making it a comfortable six person cruising boat. A real strong suit is the large enclosed flybridge area. There is comfortable seating for six plus another aft deck area. Access is through a deck hatch that has a fiberglass hatch cover. The stair case to the bridge has plenty of grab rails and the steps are non-skid. These boat details are subject to contract. Note: Offers on the asking price may be considered. 2007 Meridian 341 Sedan MOTIVATED SELLER! This is a very clean boat with only 137 hours! She has been well cared for and will not disappoint! She is loaded with all the bells and whistles and offers a great platform for entertaining featuring a large salon surrounded by panoramic windows, two staterooms with a sleeping capacity of 6, an enclosed head with separate shower, and a spacious flybridge. Equipped with: Twin 320 HP 6.2 mpi fresh water cooled Mercruiser gas engines, bow and stern thrusters, Northstar navigation and Smart Craft systems (GPS, depth finder, etc. ), generator, 50 amp shore power, battery charger, two-zone air conditioning and heating, central vacuum, cedar-lined closets, AM/FM/CD/DVD system, SiriusXM satellite radio, salon and bridge speakers, full galley with microwave/convection oven, 2-burner cooktop, galley and bridge refrigerators, dual recliners in salon, swim platform, transom door, radar arch, full bridge enclosure, and fully enclosed cockpit, exterior carpeting as well as for bridge, windlass, a remote spotlight, and sun pads! 4 new batteries were installed in 2016. this is a very clean low hour boat with all the bells and whistles. powered by the 6.2 mpi fresh water cooled mercury engines with only 137 hours. 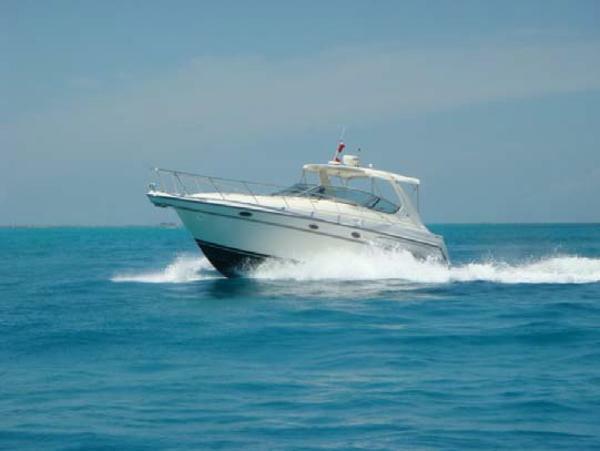 she is equipped with the following as well; generator, air and heat, central vac, bow thruster, stern thruster, radar, gps, depth finder, vhf radio, full galley, tv dvd players, entertainment system, enclosed head and shower, 2 staterooms, great layout, spacious and well layed out flybridge, shore power 50 amp, battery charger, swim platform, transom door, radar arch, full bridge enclosure, fully enclosed ckpt, windlass, remote spotlight. this boat has been taken care of very well and it shows. she will not disappoint!! 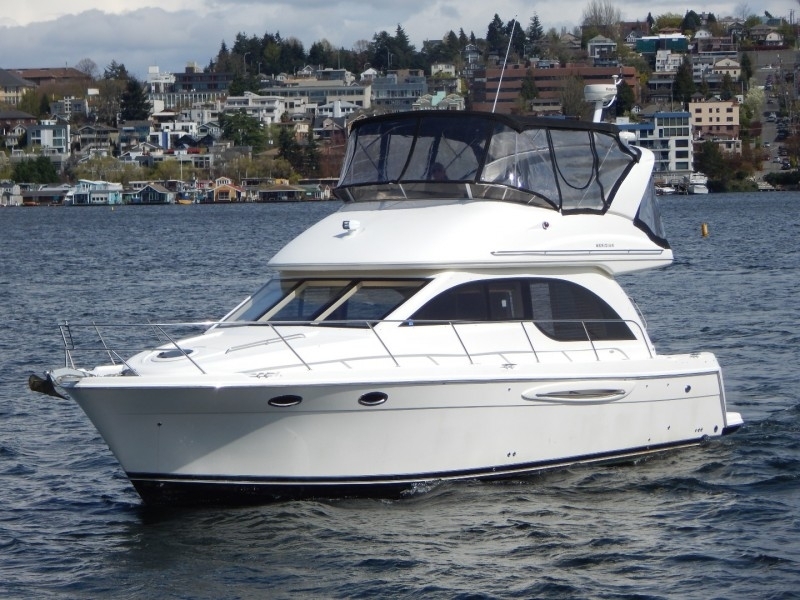 2004 Meridian 341 The Meridian 341 is the perfect blend of style and substance. A modern profile is complemented by thoughtful extras onboard. A solid cherry wood interior adds a special elegance. A large entertainment center in the salon is perfect when gathering with friends. Granite countertops in the galley are both striking and durable. Two large staterooms leave you plenty of space at day's end to stretch out and rest with ease. 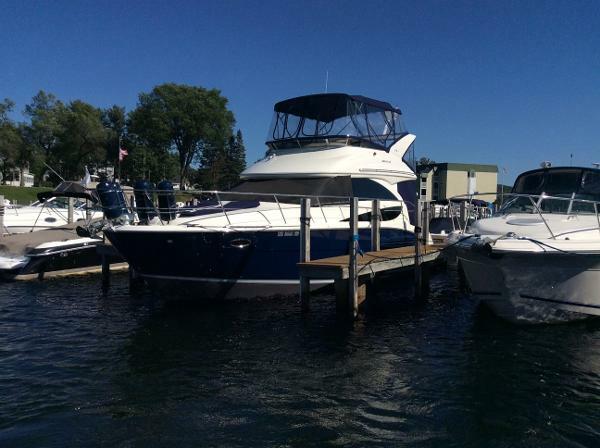 Easy to dock as this boat has both bow and aft thrusters! In the expansive salon you will first notice the tan leather seating. The salon has a very open concept and there is so much comfortable seating available for you and all your guests. The galley is to the right as you enter the salon through the large sliding window. The counter top is granite, and the galley sink is accented by a very large window. No porthole windows on this yacht, adding to the large feel of the salon. The dining table can be moved into two different locations in the salon. The A/C venting on this yacht is unique and something that you might find on super yachts. The A/C units pump cold air into a channel in the molding over the entire top end of the salon. The cool air gently spills over the lip along the entire length, rather than blasting out cold air through one three inch opening. No cold spots, just a cool salon.Snap-in carpet is in place inside the salon for protection. Of course, this can be easily removed then re-installed depending on your preferences. The carpet under the snap-in carpet is soiledand will require shampooing. There is one rub mark on the port side that is maybe 3 inches long but is not obvious until pointed out. Other than that, all systems are a go. The stateroom is ample-sized and is furnished with a very accommodating queen sized bed and flat screen TV. Included, of course, with this floor plan is a queen sized guest quarters.The flybridge is just as beautiful as the rest of this yacht. Leather seating for the captain and his crew, including a built-in chaise. There's even a large deck for lying out in the sun. The aft deck and steps leading to the flybridge have been completely redone with brand new Sea Deck material. 2003 Meridian 411 Sedan Bridge This one is a beauty!! Picture yourself cruising the waterways on this 411 Sedan Bridge.There is plenty of room with it's 2 full staterooms/baths. The galley and salon offer a 360 degree panaramic view. If outside is where you would rather be, the spacious fly bridge has enough seating for the entire crew and surround sound for entertaining. 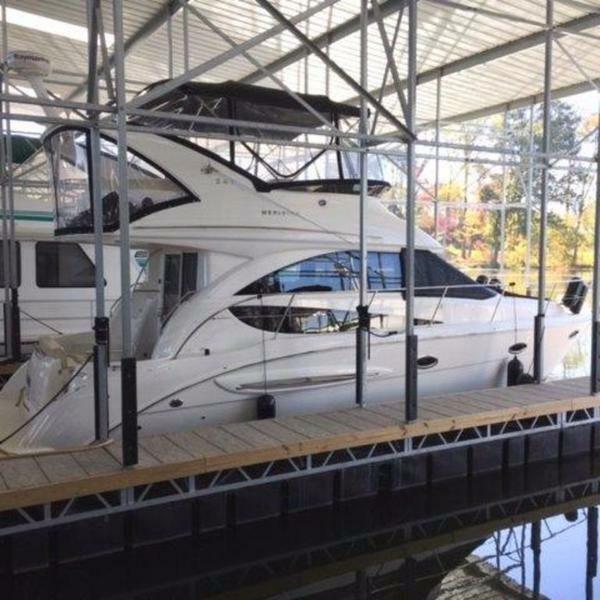 There is ample storage for all your accessories and boating equipment. 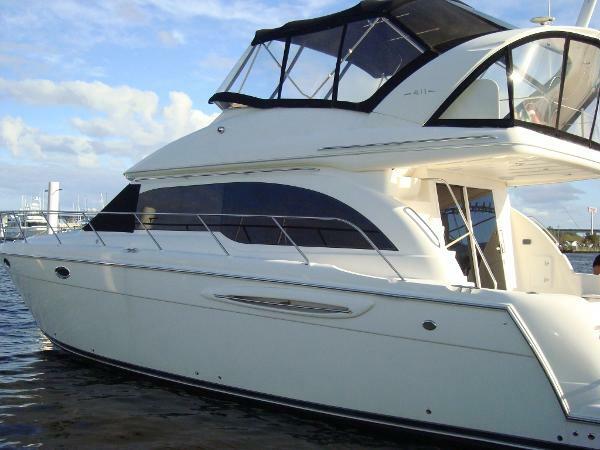 This Yacht shows brand new and has been meticulously maintained. Fresh Bottom Paint November 2016. New AC in Master Stateroom, New After cooler Starboard engine, New 11 gallon Water heater. All engine and generator service is up to date. For more information call Greg McNabb 757-641-7891. 2003 Meridian 411 Sedan Bridge 1150 Hours. This is a beauty!! Picture yourself cruising the waterways on this 411 Sedan Bridge.There is plenty of room with it's 2 full staterooms/baths. The galley and salon offer a 360 degree panoramic view. If outside is where you would rather be, the spacious fly bridge has enough seating for the entire crew and surround sound for entertaining. There is ample storage for all your accessories and boating equipment. 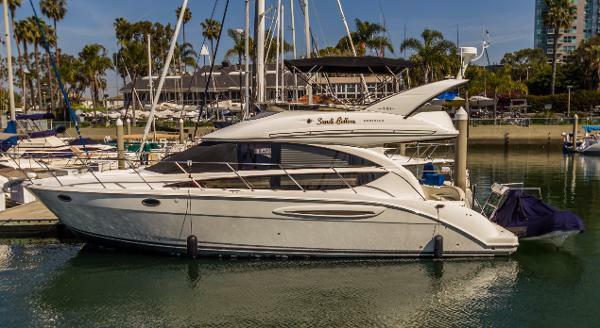 This Yacht shows brand new and has been meticulously maintained. Fresh Bottom Paint November 2016. New AC in Master Stateroom, New After cooler Starboard engine, New 11 gallon Water heater. All engine and generator service is up to date. 2012 Meridian 341 Sedan The 341 Meridian Sedan Bridge is best in class. A perfect condo on the water with all the amenities, sleeps 4-6 and is very fast for this size yacht topping out at almost 40MPH. It has twin MerCruiser 8.2L MPI HO DTS, inboards (425hp ea.) with only 115hrs. of use. It also has dark cherry matte wood interior, bridge refrigerator, 9" Raymarine Chartplotter, GPS, radar, navigational system, blue colored hull upgrade, blue full canvas enclosure, generator, bridge cocktail table, exterior carpets, interior carpet runners, foredeck sunpad, cockpit to bridge door, all chain windlass, anchor, A/C, heat, central vacuum system, linen pkg, master stateroom entertainment, salon screen door, coca solid surface countertops, interior colors taupe/tan/plum, shore power with battery charger and a grey water system. 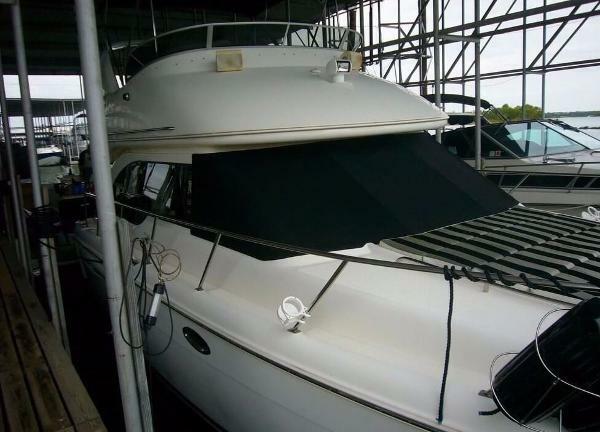 The owners of this boat take pride in keeping her in bran new condition and always maintained Irwin Marine. 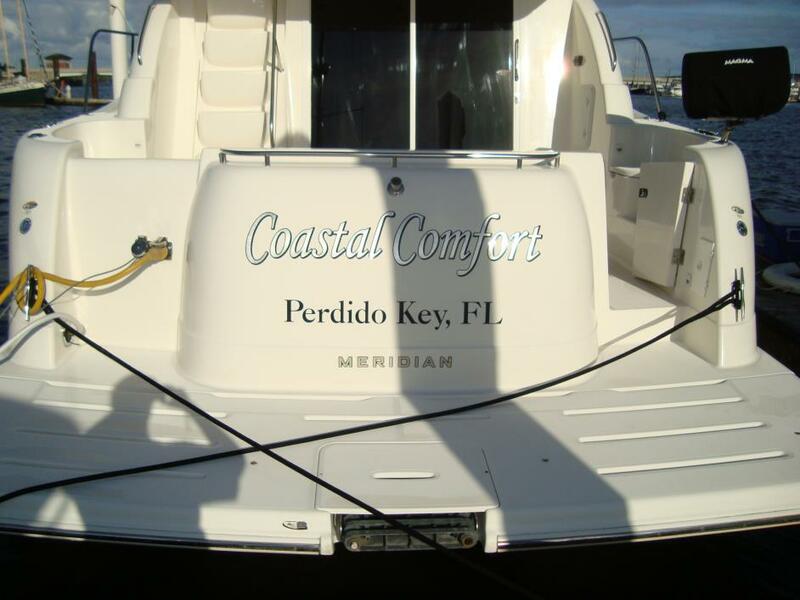 2012 Meridian 341 Sedan 2012 Meridian 341 Sedan This is a LIKE NEW Freshwater Undercover Kept 341SB that has only 84 hours on Mercruiser 8.1l MPI HO Engines. It is equipped with Generator; Air/Heat; Raymarine Navigation C-120 GPS/Plotter/Radar; Bridge Refrigerator; Bimini Top with Full Enclosure; Bow and Stern Thrusters; VHF Radio; ST-60 Depth Finder; Sptotlight; Windlass with Anchor and Rode; Smartcraft Vessel View Monitor.